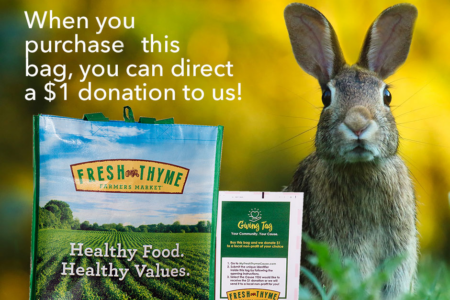 Check out the amazing Fresh Thyme Giving Bag Program! The program offers a special Giving Bag featuring a Giving Tag which allows shoppers to direct a $1 donation to qualifying non-profits. This is a great opportunity for us to raise money simply through the sale of a reusable shopping bag. Visit any Fresh Thyme store, buy a few of the Giving Bags, and you can choose to direct the donations to us. And remember to spread the word – the more bags purchased, the bigger the impact for our neighbors in need! Fresh Thyme Markets can be found locally in the Bridgeville and Pleasant Hills areas.